If you are a developer or existing team/startup focused on building a business that takes advantage of the Kinect and Natural User Interface technologies, then the Kinect Accelerator is where you need to be. Through this program, Microsoft is supporting entrepreneurs, engineers and innovators like you to bring to life a wide range of business ideas that leverage the limitless possibilities Kinect enables. Also by the way, the gesture motion code that you sometimes see all runs on the client (i.e. your PC or xbox). That's not something that could be easily put on a microcontroller! If anyone's interested in sharing ideas on communicating with the kinect please ping me (or just post here i guess!). Would you be able to run the code you need on a 32-bit microcontroller? Maybe that's the next hardware iteration to allow running stuff like a Kinect? 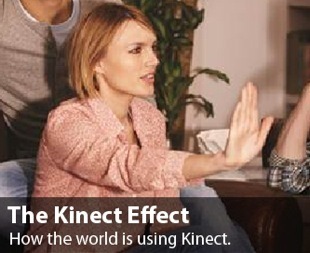 It's just Microsoft trying to market their Kinect system. Read in the FAQ you may actually have to relocate to Seattle for the duration of the project. They don't mention who's paying for your room and board for that period. I suspect $20,000 in Seattle will not go very far. I think you're right there...an ARM based Arduino could likely handle the mass of data from kinect. Yes, it would be a nice step after the optical flow stuff...more vision based robotics. I was thinking obstacle avoidance or even a visual replacement for the sonar! It's the high-speed USB for the depth camera that's got me stuck at the moment. The main problem with using kinect for arducopter is that it will not work outdoors, but will definitely allow for some cool arducopter indoor projects where GPS is not available. thanks, that is a shame. do you have any information about why it doesn't work outdoors? I didn't know about this issue but what springs to mind is that the kinect projects a parttern of spots with a IR light (a low-powered laser?) and then reads them back in with a camera to determine distance and perhaps there would just be too much interference outdoors or the dots would no longer be visible?